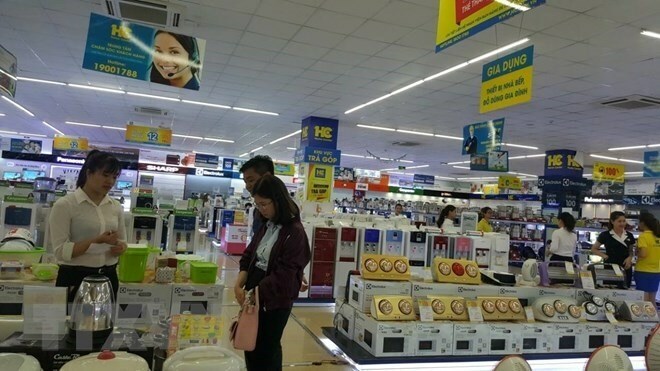 HCM City (VNA) - Electronic goods shops and supermarkets in HCM City are offering big promotions on air conditioners, refrigerators and fans as the hot season approaches. Shops and supermarkets in HCM usually offer discounts of only 10 or 15 percent, but as the peak hot season is near, they are now discounting fans and air conditioners by 15 to 50 percent and offering free delivery and installation, as well as a zero percent interest rate on installment payments. Tran Nguyen Anh Tu, sales clerk at Thien Hoa Electronics Centre, said sales of fans and air conditioners had shot up by 50 percent compared to earlier last month, and were 25 percent higher than the same period last year. Demand is expected to continue to rise in the coming months, with sales predicted to go up by 25-30 percent, she said. Traders said that fans from companies KDK, Panasonic, Mitsubishi and Asia are priced from 300,000 VND (13.45 USD) to 1 million VND for low-end products and up to 3 million VND for high-end products. The most popular are 1-1.5 HP air conditioners from Toshiba, Daikin, LG, Panasonic and Reetech, with prices between 8 million VND and 12 million VND.